Posted on February 21, 2018 . by Patrick Johnstone. Leave a comment. 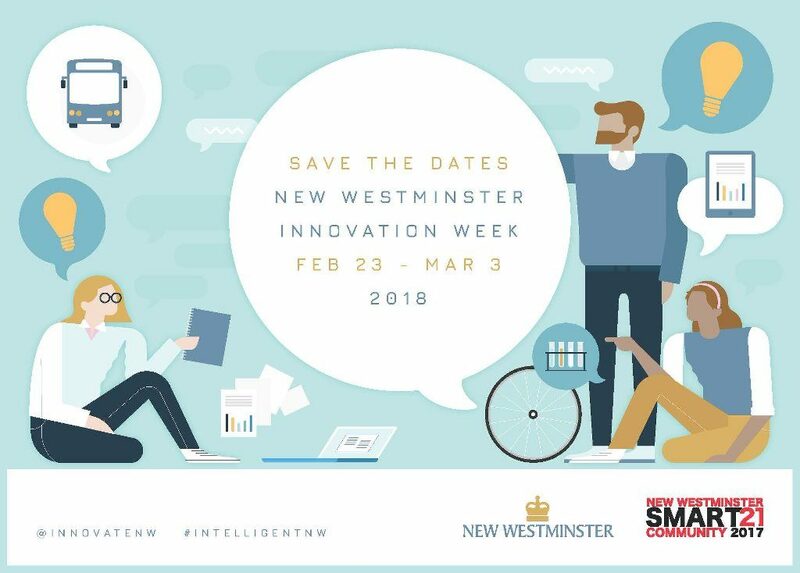 As part of New West’s Intelligent City initiatives, Innovation week is a showcase of how technology, innovation, and sharing information can make our City work better, can make us a stronger community, can make businesses more prosperous and residents happier. It is about strategically leveraging innovative ideas like the City’s award-winning Open Data portal with hardware like the BridgeNet fibre network to build a better and more equitable future. Now I read that last paragraph, and it is all true, but it doesn’t really tell you what Innovation Week is, does it? Let me try again. Innovation Week is a series of panel discussions, hands-on workshops, networking sessions, tours and activities all open to the public, and inclusive of all ages, experiences, and interests. There will be classes to teach kids about coding, a Hack-a-Thon for teams of coders to develop new tech, forum discussions about new ideas, chances for Tech start-ups and businesses of all sizes to connect with Private and Public funding sources to bring ideas to reality. All wrapped up in fun enough with arts and music to keep your mind fresh. Through the week, you will be given reasons to dream, and information and resources to make that dream work. Metro Conversations is a talk series I have been helping to organize with council colleagues from other municipalities. Out Fifth Conversation will be on Tuesday the 27th in the evening on the topic of The Promise of Innovations in Transportation. But instead of just dreaming of autonomous vehicles and hyperloops and Tunnels, we are going to ask whether the technological promises addresses what we actually want from our Cities – safe streets, livable neighbourhoods, sustainable communities, social connections and equity. This will be a fast-paced hour-long conversation, free to attend, but you might want to register as we don’t have the biggest room. As a bit of a primer: watch this video form 1958, and ask yourself, is this the community we want? And how does this differ from Elon Musk’s vision of tunnels and hyperloops “connecting” our community. The second event I with broad regional appeal for people like me who care about Sustainable Transportation and how it interacts with City Planning will be the Transportation Forums on March 1st. I’d suggest you book the time off work and enjoy the entire day, but you really don’t want to miss the evening event, as Mobility Pricing is sure to be the hottest political topic in the Lower Mainland through the fall elections and into 2019. 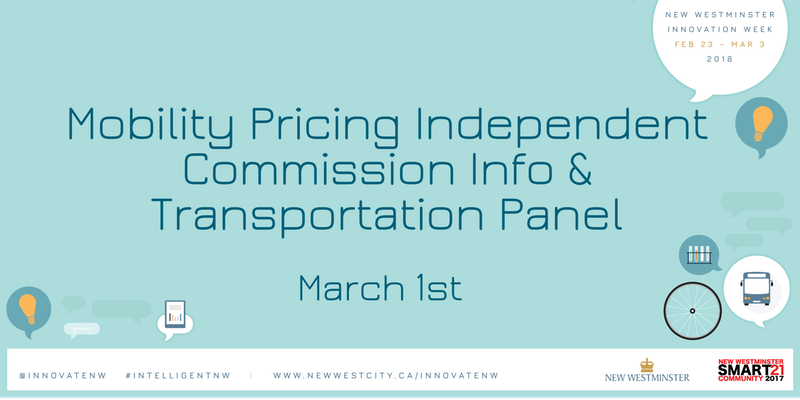 The evening forum will feature the Chair of the Mobility Pricing Independent Commission, one of the most respected and outspoken Urban Planners in Canada, and an Economist who can unpack the idea of what “fairness” is when it comes to paying for our regional transportation infrastructure. The Mayor of New Westminster will moderate the discussion, and it is free to attend. If you are like me, you may be interested but apprehensive about Mobility Pricing. I have engaged in TransLink’s “Its Time” consultations, and understand how Mobility Pricing works in Singpore and London and Helsinki, but am cognizant of the challenge we have in Vancouver setting up a system that fits our region, and can be politically supported by the broad interests of the region. I’m hoping this forum will answer some of the questions I have, and allow me to better engage with the proponents and critics of road pricing. There is a tonne of other great stuff happening between February 23 and March 3. Please come out and support these events, and thanks the many sponsors who help lead these conversations in New West. That link again. Posted on February 20, 2018 . by Patrick Johnstone. Leave a comment. Apparently it was a cold, sunny day on February 19th, but Council Chambers were kept warm with a mid-day Workshop on the City’s Economic Development Plan (which you can see here and read here). This Bylaw makes a bunch of “housekeeping” changes to our Zoning Bylaw. These are changes like replacing the word “church” with the words “place of worship” to modernize the language, and “Update references to Local Government Act Section 921 to Local Government Act Section 493” to catch up to changes that happened in other legislation, and to standardize units of measure. This should be pretty uncontroversial stuff as we are not changing any practices here, just updating language to clarify existing policy. Not surprisingly, we had no correspondence on the Bylaw, and no-one came to speak to Council on the issue. Council moved to Refer this Bylaw to the Council Meeting immediately following, where Council gave the Bylaw Third Reading. Steel & Oak wants to expand their seating area from 30 seats to 50, and this requires a Zoning Amendment, as we don’t currently have a zone in our Industrial Areas that allows public assembly of more than 30 customers. S&O have been great business leaders in the City, helping at a variety of community events, and becoming unofficial spokespeople for their home community. Their operation has not caused any concern with the neighbours, Bylaws or the police. Alas, our long legacy of Bylaws often means it takes way too long for zoning changes like this to work through our processes, and this should not have taken more than a year, but I’m glad we finally got to this point so S&O can hire more staff and continue to build our local economy. We received no correspondence on this application, and only the Proponent came to speak to the amendment. Council moved to refer this Bylaw to the Council Meeting immediately following, where Council gave the Bylaw Third Reading and Adoption, and also passed a follow-up resolution to support S&O’s application to the Provincial Government for the concomitant license change. We discussed this during our recent workshop on Cannabis regulation, The City is making a temporary change to the Zoning Bylaw to clarify the current regulatory environment, in preparation nfor the new regulations we hope to have in place for when the Federal Government legalizes the recreational cannabis industry. Even since I wrote that piece a couple of weeks ago, there has been some change both provincially and federally in regards to senior government framework and timing. Staff is working on putting together a public consultation process, and hope to bring a comprehensive set of regulations to Council this summer. We had a couple of people come to speak to this issue, mostly involved either directly or peripherally in the industry, and mostly curious about what our permanent bylaw regime is going to look like. Council moved to refer this Bylaw to the council meeting immediately following, where Council gave the Bylaw Third Reading and Adoption. A Resident in Brow of the Hill wants to formalize a secondary suite, but doesn’t want to knock down a tree to build another off-street parking space. That requires a variance. One piece of correspondence appeared on table in opposition (in the interest of full disclosure – letter from a former employer of mine! ), and the only the proponent appeared to speak in favour. IMO, the Brow needs as many trees as it can get. Council moved to approve the variance. This property in the Brow has been difficult to develop because it is on a steep slope and the only street frontage is on the top edge of the property. It has been vacant for some time as a result. The request is for the City to allow off-street parking in the front yard (though the house will really “front” facing down the hill, the primary road access is technically the “front”), which requires a variance. No-one in the neighbourhood seemed to object, and staff think this is a reasonable solution. Council moved to support the variance. AI put these together, as they are two adjacent properties with the same issue. The extra-deep 147-foot lots on Johnston Street (no relation! ), when subdivided to a pretty typical modern width (33 feet), don’t comply with one of our Zoning laws that say the long side of a lot can’t be more than 4x the width. So they need a Variance. These lots are common in Queensborough, and not particularly controversial. We had no-one correspond with us on this, and had one person come to speak in opposition, worried that there is not enough on-street parking on a street where every house is built with 4 off-street parking spaces. Council voted to approve the variance. A resident wants to open an old-fashioned quarters-in-the-slot-blast-pixelated-aliens Arcade in Sapperton. We have pretty restrictive Bylaws for arcades created in the 90’s for a bunch of reasons that probably made sense at the time (after all, this was pre-Grunge and the Seattle scene!) so they need a Variance. We received quite a bit of correspondence on this, almost all in favour. If I had known Arcade folks liked writing to City Hall so much, I’d have charged them a quarter each… the RA supported the idea, and no protests from local businesses. Council had several questions around the business plan and the potential for alcohol sales. If I could paraphrase all of Council comments: what can we do to make your business model more robust; sorry it took so long to get this organized; and hopefully Staff can bring a more permanent solution to Council sooner rather than later, but we don’t want to delay this Temporary Use permit to get you up and running as soon as possible. Good luck! We then had a slightly more detailed than expected report from our Electrical Utility on the response and follow-up to the Queensborough Bridge Electrical Fire last October. If you live in Q’Boro, you no doubt remember not having electricity for 28 hours. The fire was caused by a failure of one of the circuits in a conduit attached to the bridge, which impacted adjacent conduits. This report outlines costs related to the initial repair ($65,000), the follow-up repair to make the system stable again ($150,000), and an estimate for a better longer-term repair ($350,000). This also emphasized the need to build a Substation in Q’boro, which has always been a plan but may be accelerated due to this. This is the Bylaw that formalizes our five-year financial plan, which includes a 2.95% tax increase and a 1% capital levy. I will blog more on this when I get a chance, but for now Council moved to give the Bylaw three readings. The Q’boro RA representative to the Neighbourhood Traffic Advisory Committee is appointed. An adjustment to the representation on the EDAC, due to the inability of one member to serve, and based on an application received during the most recent Committee Application process. We have some staffing issues in our Planning Department. Part of it has to do with retirements and attrition, some with a very aggressive set of Council initiatives that have eaten up a bunch of planning staff time – Implementing OCP measures and the HCA, proactive approaches to Affordable Housing, ongoing development and new policy areas like the Cannabis regulations and Short Term Rentals. Staff are giving Council (and the public) a bit of notice here that their capacity for new tasks is getting strained. I am concerned that we will get caught flat-footed on Short Term Rentals policy, but recognize our bandwidth limits here, and cannot think of any of the prioritized policy areas that I would “bump down” to put STR policy on the fast track. Another approach here is to expand our capacity, but this will be an ongoing discussion on Council as we are near the end of our 2018 Budget process and may need to defer this discussion for the next budget period. Construction sometimes sticks you between a rock and a hard place. Sunday morning construction is a hassle for neighbours, but sometimes needs to happen. In this case, the builders need to close two lanes of Braid street, which would have bad impacts on neighbourhood and regional traffic if done mid-week, and the Saturday would be better, but there is a Wedding being held next door! A wedding! So Council granted a variance to allow one day of Sunday construction so the school project can put up their roof trusses. Construction sometimes needs to happen at bad times because it works better then. Major sewer works especially work better at night when sewer loads are smaller, for obvious reasons. Treatment of the major sewer works under Columbia Street with a Magnesium Hydroxide every once in a while prolongs the lifespan of the works by counteracting the chemical erosion caused by the hydrogen sulfide that emits from your… uh… waste. Council moved to give this variance so the milk of magnesia can be delivered to the guts of the City. The topic of Temporary Modular Housing has been pretty hot in Vancouver, where the homelessness crisis is most acute, and there has been some push-back from residents there around plans to give their neighbours safe roofs over their heads. Here in New West, our staff have recognized that there is demand here for these facilities, but we are challenged by a general lack of City-owned land upon which to place them. Perhaps ironically, two potential candidate locations the City owns are not available because the City has provided them to not-for-profits to build permanent non-market housing, a project that has been going on for more than a year. Staff have evaluated many pieces of land in the City over which we have some control (City and Provincially-owned), and have identified two priority locations, one in Queensborough, and one on the Mainland. We are moving forward with geotechnical analysis (the temporary buildings need to have solid footing) and working with the province to determine how to best bring these sites on-line, or even if the province is interested in bringing their program to the sites we have available. I think Council is interested in seeing these developed as part of our comprehensive approach to housing affordability, and I hope we can fast –track any approval the City need to provide to pave the way for getting people into safer homes. Its cold out there people. Creating a more comprehensive Asset Management program is one of the Strategic Priorities set for this Council term. The very short version of this is to look at everything the City owns that has a lifespan (road lines, telephone poles, HVAC systems, sewer pipes, that arcade-style basketball hoop thing at the Canada Games Pool, etc.) and provide a systematic process to evaluate their lifespan, maintenance and replacement cost, and put those costs into a financial framework to better assist long-term financial planning. Luckily, the FCM is giving out grants to support this kind of work, and we are going to apply for one of those grants. Cross your fingers! The parish of the historic Holy Trinity Cathedral are hoping to develop their lot in order to raise funds for restoration of their building, expansion of the community space on their campus, and to provide both non-market and market secured rental and strata residential units in the same building. Although this project has already seen a couple of years of reshaping, it is still pretty early in the process for the project. There will be public consultation and a public hearing if this project proceeds. Stay tuned. This is an information report brought to catch Council up on some issues raised more than year ago by some residents of float homes in Queensborough. For the most part, they are living on water lots under Port of Vancouver jurisdiction. For reasons going back through decades of zoning decisions, there are other people living in legally non-conforming residences on the “flood” side of the dyke, in lots that are at least partially Port jurisdiction, and can only be serviced through the Dyke (which comes with another set of complications). 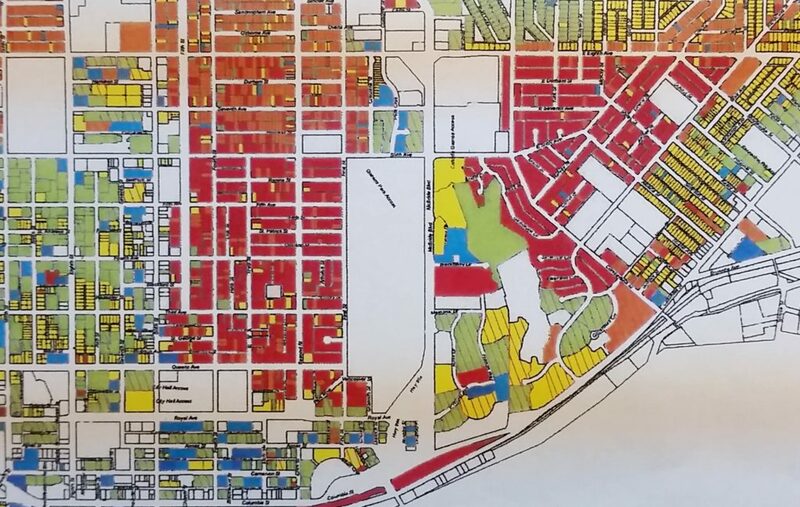 The Port’s land use plan for their water lots are more industrial than the current use reflects, or even what the City’s long term use plans may be. Short version: the Port doesn’t like float homes expanding into their industrial land base, and the City is reluctant to provide services to them, especially if the Port doesn’t approve. The ACTBiPed was provided a presentation from the Road Safety Law Reform Group pf BC, a collection of road safety advocates, cycling groups, lawyers and Public Health researchers, outlining the need for a serious reform of the Motor Vehicle Act of BC. The very fact it is called the “Motor Vehicle Act”, but is the primary provincial regulation covering the use of the provinces’ public transportation realm is telling – we need to start thinking about the safety of all users of public space, and distribute the rights and responsibilities more equitably. The Act was drafted in 1957, and hasn’t changed much since. The proposals of the RSLRG, are mostly changes to protect vulnerable road users, and are based on research done in other provinces (most notably Quebec and Ontario). They start with redrafting the Act as a “Road Safety Act”, and separating different road users (motorists, cyclists, pedestrians) based upon their real risk and the different ways they operate in public spaces. This includes changes to make cycling more safe (i.e. a three-foot passing law, clarifying when a cyclist may pass on the right and lane occupancy priorities), and for make in pedestrian spaces safer (including rules to reduce cyclist-pedestrian conflicts). There are also several well-understood and researched safety changes, including making 30km/h the default speed limit on local roads without a centre line, allowing “red arrow” lights to restrict right turns, etc. ACTBiPed asked Council to endorse the recommendations made by the RSLRG, and to sponsor a resolution at the upcoming UBCM meeting in support of modernizing the MVA. Council approved. This is obviously an emergent technology, and one that most local governments want to support to reduce the air pollution and GHG impacts in our community. Some communities are aggressively updating their zoning and development Bylaws to encourage or force the installation of works required to facilitate plug-ins in new residential and commercial buildings. Council asked staff to review and bring back options for us to approve new requirements and make it easier for our residents to switch to electric. Council gave the Bylaw that codifies our 2018-2022 Budget three readings. Council adopted this Bylaw that gave a homeowner working on a heritage Restoration a little more time to get his requirements fulfilled. Councillor Williams brought forward this Notice of Motion a couple of weeks ago. I support the intent, but the actual motion included a “due date” I was concerned about. I think we need to work with Metro Vancouver’s Zero Waste Program, and this is something we can roll into the Environmental Policy update staff is working on as part of our Strategic Plans this Council Terms. Finally, I note we are not alone in doing this, as Port Moody and Victoria are on the bandwagon here, and I suspect we may be seeing Provincial action soon. And that was all except for the singing. Yes, we sang. Posted on February 19, 2018 . by Patrick Johnstone. Leave a comment. Have you changed your views on the Stormont Connector now that there is an opportunity to revamp the access to the new Pattullo Bridge? You were against the connector a few years ago. Do you still want all that traffic meandering through your residential areas? To your first question: No. And your second question sets up a false premise. The Stormont Connector is a really expensive solution to a poorly defined problem, as I wrote about at length six (!) years ago. 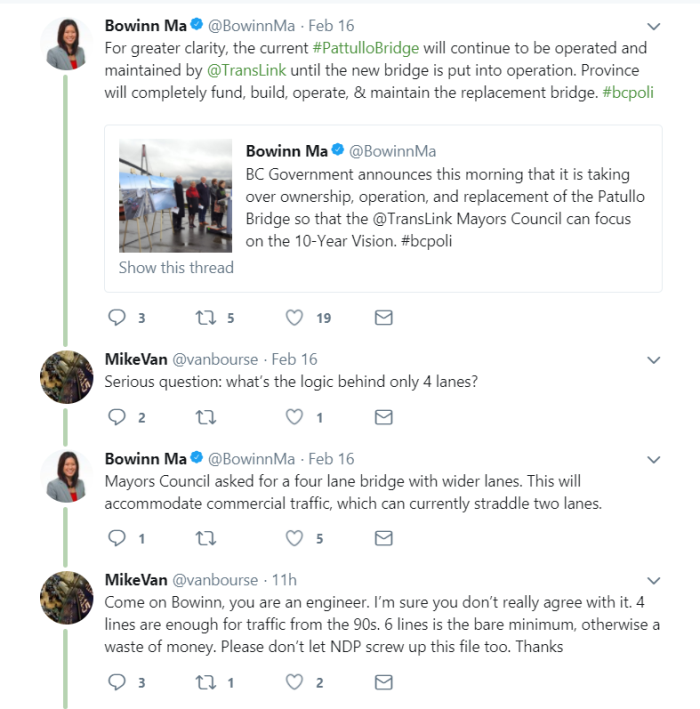 Nothing has substantially changed since I wrote that, except that the plans for Pattullo replacement have shifted from a 6-lane bridge to a 4-lane bridge, and the Port Mann now provides 10 toll-free lanes shifting even more regional traffic to that bridge. 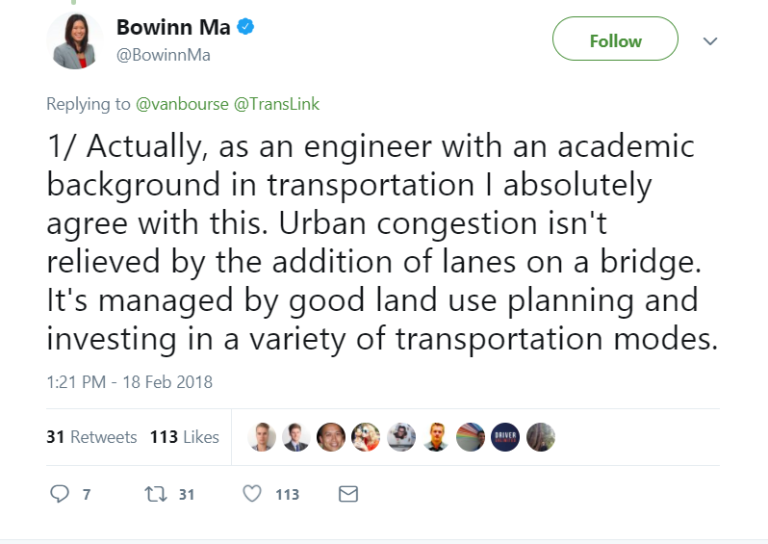 If anything, we have less reason to spend billions of dollars building a freeway through the middle of our city, and asking Burnaby to do the same. Do I want rush hour traffic meandering through New West neighbourhoods? 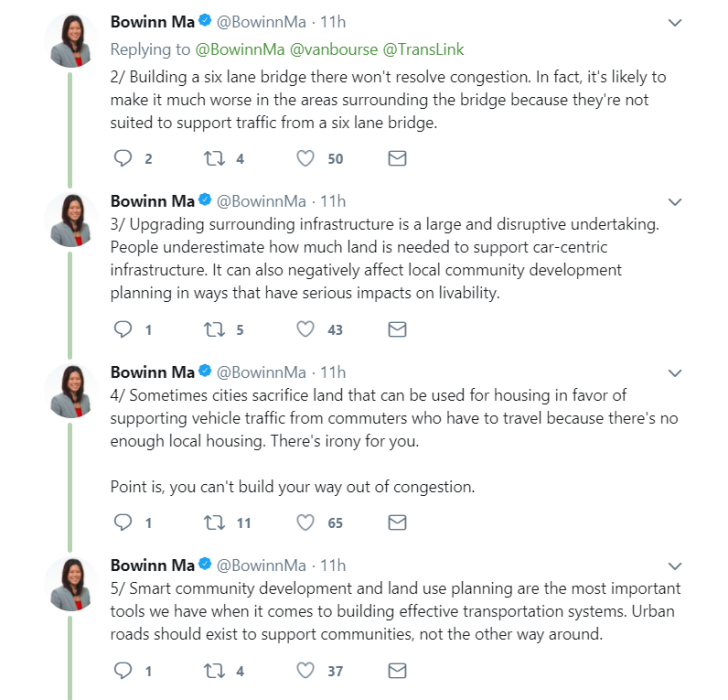 Not really, but I also don’t want a freeway running through the centre of the City, and there is no reason to believe that adding the latter will take away the former. It simply doesn’t work like that. So TransLink and the Ministry of Transportation are going to replace the Pattullo with a similar-capacity bridge, and there will be some minor increases in vehicle through-put, mostly related to better designed intersections at each end of the bridge. I think the opportunities New West has through this process are to improve the east-west connections through our City. We can make it safer and easier for Victoria Hill residents to walk and cycle to Downtown or to QayQayt. We can safely connect the Central Valley Greenway across McBride (finally) with enhanced connections to the proposed Agnes Street Greenway. We can vastly improve the public realm around Albert Crescent Park. There are many potential wins here for the City of New West, I just don’t see how a Stormont connector is one of them. Posted on February 9, 2018 . by Patrick Johnstone. Leave a comment. This is our annual budget consultation. As required by the Community Charter, our budget must be balanced over a 5-year cycle, and there are some prescriptive reporting requirements. We also provide more information in order to make the somewhat enigmatic budget figures more understandable. I will blog more about this in the coming weeks, but the short version of the draft plan is that general revenues are projected to go up by about $5.8 Million. Of this, about $1.6 Million (28%) is from new taxes related directly to growth and $1.3 Million (22%) is related to new fees collected mostly from supporting growth (permit and engineering fees, for the most part). Add to this a proposed 2.95% tax increase that bring in an extra $2.2 Million (38%), and a new 1% Capital Levy to support our ambitious capital renewal plan which will bring in about $750K (13%) to be directed to our Capital Reserves. Utility rates are, not surprisingly, going up mostly due to local and regional Capital investment, from water tunnels under the river to new sewer treatment plants. We are still not sure what BC Hydro will be doing with electrical rates in 2018, as the utility predicted a 3% increase and the Premier suggested he would freeze that for a year. We will need to talk about the long-term policy implications for the City of BC Hydro creating unsustainable deferment accounts – we need to maintain our capital (including some new substation needs) and need some certainty in rates to plan for that. We had a few people present to the plan, some sharing our concern about the infrastructure gap and the need for Senior Governments to help local governments, others with more technical questions about the numbers. We also received some written correspondence on the budget. Council moved to receive the report, and staff will now work towards creating supporting Bylaws to make the Financial Plan official. Why has no-one told me there is going to be an election this year? As God is my witness, the fountain of information coming out of the Provincial Government has been unrelenting, with new and constantly-updating financing and declaration rules. However, these Bylaw changes are simply about making sure our local election rules comply with the Provincial regulations. There will be little change here, except the dates of the early ballots will be adjusted to avoid the polls falling on the Thanksgiving weekend when many people travel. This HRA project has been delayed by the owner for a few reasons relating to family issues. The owner does plan to proceed, but needs some more time. As these Agreements have deadlines, Council had to agree to extend the deadlines through a Bylaw. The new High School project is rolling along, but unlike the RCH project (see below) it doesn’t need any zoning approval or anything from the City. However the City does have some interest in the transportation connections, relationship to Massey Theatre, the Moody Park Arena and Mercer Stadium. So it is good to get an update on the plans as they move along. Mostly, seeing as we have no regulatory role, I think the City’s main desire here is to stay out of the way and let the new School get built. The one issue we needed to deal with is a triangle of land that belongs to the City but the School District wants to use for crane installation and construction staging. So we are making that happen. A developer is working on a plan to build a mixed-sue building on a vacant lot in Sapperton. It will combine street retail, office space, and purpose-built secured rental housing. To secure the potential residential units as rental for the life of the building, a legal agreement will be prepared between the City and the developer. This report outlines the principles of the agreement, and now that council endorsed the principles, staff will draft a formal agreement as part of the development review process. A portion of land adjacent to Tanaka Court (the road one uses to get to the Lowes parking lot in Queensborough) belongs to the City, and though it is designated as part of the road, it is only really useful as part of a redevelopment of the adjacent piece of vacant land. In order for the City to sell it, we first have to “close the road”, so it is a titled lot, or can be amalgamated on to the adjacent lot. That takes a Road Closure Bylaw. Assuming the Ministry of Transportation approves, this Bylaw will go to a public Opportunity to be Heard. Watch your local CityPage for the announcement! Parks and Recreation are ready to pull the switch on their major registration and facility management software upgrade. This is the software used for all recreation and cultural programs and facilities rentals. Naturally, this is a big shift, but staff have been working on this for a year the new provider of the software has a solid reputation with a lot of experience at this stuff. Fortunately, they are a Burnaby-based company, and there are 22 other municipalities that use the system, so we are not all on our own here. That said, its new software, so expect a few hiccups and a bit of time on a learning curve, but hopefully registration will soon be smooth and easy like never before! Library upgrades: The Library is our second most-visited facility (after the Canada Games Pool), and hasn’t seen major renovations in a few decades. The older side of the building is from the 50’s and needs some pretty significant work done on the building envelope and stricter, aside from the need to upgrade the facility to suit modern needs. Libraries are very different places in 2018 than they were in 1958, and we have not kept up with that change. So there will be (unfortunately but necessarily) disruptive work going on in the building for the next year and a half. The ongoing plan is to only deactivate portions at a time to keep as much continuity in service as possible, so please be friendly to the staff as they make the best of a bad situation. The end result will be worth it! Economic Development: The City has taken a more proactive role in Economic Development in the last few years, and are very fortunate to have great partnerships with our Chamber of Commerce, our two “official” BIAs and three Business Area Associations. The major thrust here is through the Intelligent City initiative to promote and retain more tech-savvy businesses while continuing to support our retail and commercial areas as the population grows. This is a never-ending job, but a solid strategy and team is vital. Environment Strategy: It is time the City did a comprehensive review of its various environmental programs and initiatives, and provide a strong framework plan to assure we are being strategic with our priorities. There was some great initial public consultation for this program in the fall, with some new ideas, some suggestions and criticisms of the City’s current programs, and visions of a more sustainable City. We expect to see a policy document some time in late spring bringing these together. This is a proposed development in the Downtown Tower District that combines a Market condo tower (a little shorter than the adjacent Plaza88 tower) with a smaller tower of non-market rental suites. The organization running the non-market Tower is called PAL, and they hope to run a facility similar to one they have on Coal Harbour where seniors who have worked in the arts can live in a means-tested affordable housing building attached to the market tower. The project will be going to public consultation and eventually to Public Hearing, so I don’t want to say too much about it until the public has a chance to chew on it. However another topic came up through the discussion of the project, and that resulted in a follow-up motion from Council. I did, however, raise a concern about the amount of parking going into a building that is immediately adjacent to a SkyTrain Station – 275 parking spots for a 270-unit building (including guest parking and some parking to support the commercial in the podium). I think we are at a time where we can start significantly reducing the parking numbers for developments like this. Underground parking is a significant cost for developers: depending on site and ground conditions, $30,000 – $50,000 per spot. Underground, they make construction much more expensive and disruptive to the community as large excavations and de-watering projects must be tolerated; above ground, they create out-of-scale buildings with terrible streetscape. The City has a program where developers can build less than our regulated “parking minimum”, but they must pay cash in-lieu to the City based on some formula. This program dates back to 2011, and may need a revisit, as times change and we have a new Master Transportation Plan and housing affordability issues that this should directly address. During Q&A, this developer expressed concern about the cost of building four levels of parking, and was confident they could market the condos without parking spaces – it is the City and our policies that are forcing so much parking to be built across the street from a SkyTrain. So, we are going to review these policies (though I suspect it is too late for this specific project). This report outlines the shape of a Housing agreement that would assure the second building in this development would remain non-market affordable housing for the life of the building. If the project were to be approved, these are the conditions the City would expect the developer and not-for-profit operator to stick to. Aside from some subtlety of language around storage space allocation and a bit of a follow-up gripe about requiring parking in a supportive housing development, Council moved to support the principles in the report. After a report from our Police Department, some awards given to a couple of outstanding officers, and some proclamations and public delegations (I blogged a bit about a few of them here, and will talk about another on in a subsequent post), we moved onto the items Removed from Consent for discussion. Staff and the Arts Commission worked on a policy where the City could support community-driven mural projects on City and private buildings. It looked pretty good, but Councillor Trentadue did raise an interesting issue around how the City seems to be creating a situation where people wishing to beautify their own private building may run into a bureaucracy wall when, really, outside the Sign Bylaw, we should only be interested in mural on our own property. Council moved to send it back to Committee for a little more work prior to passage. Similar to above, this is another proposed development that has not had Council Approval, but Staff is working to put together a Housing Agreement to secure the conditions of the Purpose Built Rental part of the development. Again, aside from a few minor language changes, Council supported the principles. The City has some permitting to manage as the Royal Columbian Hospital redevelopment occurs over the next decade. This report gives us some idea what is coming down the pike. It also includes a report to be used by Fraser Health and their consultants to drive the public realm designs of the buildings. From a City perspective, I am mostly concerned about how this building integrates with our traffic and pedestrian systems. If staff and visitors of the Hospital are all going to arrive and leave by cars on East Columbia Street, none of our goals for making east Columbia a vibrant Great Street are going to be realized. It will be a disaster. Good news is that Fraser Health and City are committed to making alternatives work, including moving the main automobile ingress and egress down to Brunette Avenue, and whatever changes need to happen to Keary Street and/or Sherbrook to support this needs to be understood early. We also need to assure the pedestrian, cycling ,and bus infrastructure on East Columbia is well integrated and makes those attractive options. Fortunately, the initial concepts look positive, and Fraser Health is talking Transportation Demand Management to help with their own parking issues, which is a huge step towards making a new, expanded hospital support East Columbia and the livability of the entire community. Exciting times ahead. As described above, this proposal to build a two-tower mixed use residential building on Carnarvon Street, including a supportive housing component, was given two readings. There will be a special Public Hearing on March 5th. C’mon out and tell us what you think! These three Bylaws to adjust our Council schedule, make some necessary changes to our Elections Bylaw to meet the new Provincial laws, and to authorize the voting machines for the 2018 Local Government Elections were given three readings. As described above, this Bylaw to facilitate a request for a time extension for a homeowner to do their heritage restoration work was given three readings. As described above, this Bylaw to close an unused portion of the Tanaka Court right-of-way was given three readings. There will be an Opportunity to be Heard scheduled once the Ministry of Transportation and Infrastructure is given us the green light. As discussed last meeting, this update to our procedures for record retention, destruction, and transmission to our permanent archive was Adopted. It is now the Law of the Land. It should be fun seeing what comes out of the deep file search of some of our very old Bylaws and they are transferred to digital. As discussed last meeting, this Zoning Bylaw amendment that will provide modest incentives for the building of more energy efficient homes in the community was Adopted. It is now the Law of the Land. Adjust your thermostats appropriately. This is a not-for-profit operating a community health clinic in New Westminster specifically developed to support people with language or cultural barriers to public services. They could use a little help and the City is formally asking the Province ot help them out, and to provide for more of this type of service to our new residents. The City is working on a diversity mandate for Council Advisory Committees, and I think it is important that First Nations representatives (be they from local or regional First Nations, or people who live in our community and have lived the Indigenous experience, regardless of their tradition territory) is an important part of that. We will make sure there is a mechanism in place for next Committee Recruiting season to make this happen. Happy Family day everyone. Pop by the Anvil Centre, as there will be many things happening! Posted on February 1, 2018 . by Patrick Johnstone. Leave a comment. Queen City Taxi is applying yet again, through the long and complicated process, to get more taxi licenses in order to provide better service in New Westminster. The amendment of our local Bylaw is part of the process. They wish to expand service by three regular cabs and an accessible cab. I’ve ranted about this before. We have one presentation from a resident who was concerned about lack of accessible cabs, and Council referred her concerns to the Access Ability Advisory Committee. With no other presentations, Council moved to adopt the Bylaw Amendment. There are a couple of variances needed to make this 80-unit townhouse project in Queensborough fit better on the site. Tandem parking spaces allow more flexible layouts and some separation between buildings is slightly smaller than required by the zoning bylaw (on the order of a few feet at most) . We had no-one come to speak to the variances, and received no correspondence. The project was supported by the Residents’ Association and the Design Panel, and fits with the Queensborough Community Plan. Council moved to approve the Variance and the subsequent Development Permit. Similar to the above project, there are a couple of variances needed to make this 37-unit townhouse project in Queensborough work, and again Tandem parking is the big one. We had no written submissions, but had the proponent present in favour. Again, this project is supported by the Residents’ Association, the Advisory Planning Commission, and the Design Panel. It fits the Community Plan and had a public hearing in 2014(!). This project is directly related to the neighbouring one above, and brings another 30 townhouse units to Queensborough, and had similar approvals from the community and committees. Council moved to approve the Variance and the subsequent Development Permit. All told, that’s 149 relatively affordable family-friendly homes approved for Queensborough. The 2017 was by so many measures a success, and we are getting ready to organize year two. Last year we had few spills, but many thrills. As a cycling fan, the women’s race was particularly exciting, even as the eventual winner absolutely dominated. Kirstie Lay went on a suicide solo break that lasted for way too many laps. Each lap we thought she was surely going to get reeled in, but she kept the gap up in a Merckxian display of strength and determination. It was pretty cool. Unlike Kirstie, we started a little late last year, and had a few organizational hiccups. They were small, and not really noticed by the fans or the racers, and we have learned a lot about how an event like this fits in New West. We have a head start this year, and things are already lining up. Volunteers and sponsors really made this a success. It was a fun event for the volunteers, many of them had no idea what a professional bicycle race looked like, and were amazed by the speed and the force with which this mass of athletes blasts past (they move a lot of air!). If you want a t-shirt, we always could use more volunteers! This City relies on volunteers. They provide time and energy to get so many things done in the City, but they also give City Staff and Council guidance based on their subject matter expertise. Every year we have to sift through a large pile of applicants for Committee appointments. Here are the 179 appointees to 25 committees, commissions, or boards. Thank you all, and to the many others who applied but didn’t get picked – please apply again next year! There are several “housekeeping” changes required to one of our older but still valid Zoning Bylaws. They range from correcting spelling to updating definitions and fixing now-broken references to changed provincial regulations. These changes do, nonetheless, require a public hearing, so c’mon out on February 19 and let us know what you think. A landowner want to build a single family house on a small, steeply sloped lot in the Brow Neighboruhood, and has a few challenges involving the roof height and accommodating off-street parking. This will go to an Opportunity to be Heard after reviewing with neighbours. I’ll hold my comments until after that process. There will be an Opportunity to be Heard on the required Temporary Use Permit on February 19. C’mon out and let us know what you think! The City has about $159 Million in the bank, mostly in group funds with the Municipal Finance Authority (see rant below). This annual report on our investments isn’t terrible news, but we are slightly behind where we want to be on returns on our investments. This is our ternary report on major purchases. Mostly, this serves as the final step in our transparent procurement process. Bids are open, and the winning bid is reported out to assure that we are justifying purchase decisions. The Advisory Committee for Transit, Bikes, and Pedestrians has always had strong representation from local pedestrian advocates, but there has never been a formal Organizational representation like we have for cyclists (HUB has provided a representative for several years). The Committee wanted to create an opportunity for a pedestrian advocacy organization on the committee. You may recognize the large photographic pieces attached to a couple of brick walls in the City last year as part of this program. Our Public Art Advisory Committee is recommending taking part again in 2018, and have identified a priority location for an installation: The ugly fence along East Columbia at Sapperton Park. In this report, the PAAC has recommended an artist to create the public art piece, which will be funded from our Public Art Reserve Fund. It is a great example of how Public Art doesn’t have to be a stand-alone piece in a square somewhere, but can be adding expression and aesthetic value to boring or dull infrastructure to make our communities nicer places to spend time. Speaking of boring or dull infrastructure, the fire escape built on Front Street is not the most elegant structure ever built. Once the rest of Front Street was improved, many noted it is incongruous to the new setting. An engineering marvel built to meet the newest fire escape standards, but ugly. Luckily, the City has a Public Art Advisory Committee made up of City staff, arts professionals, and members of the public dedicated to bring aesthetics, expression, and creativity to our public spaces and advise us in how to integrate art and design into our community. When many of us see an ugly structure, they see a canvas waiting to be activated. In this report, the PAAC is suggesting using some of the Public Art Reserve Fund to make this space work and look better. Council approved. This new proposed Bylaw will codify how the City manages its records. There is a bunch of regulation controlling how we, as a corporate entity, manage information. The Freedom of Information and Protection of Privacy Act balances the need to make information accessible while protecting privacy where needed. We have staff in City Hall whose job it is to manage these matters and assure all City operations comply with the law. This Bylaw would formalize that the records management are the responsibility of the City Clerk, and would formalize the process through which old records are made digital and aging records are transferred to the City’s Archives for permanent storage or, if appropriate, destroyed. Steel & Oak have a tasting room attached to their brewery in an industrial area in the Lower 12th area. They want to expand the seating capacity in their tasting room, but our Zoning Bylaw does not allow more than 30 people in an assembly space in our industrial areas. So they need a Zoning Amendment to allow the seat expansion. This will go to Public Hearing on February 19th, so I will hold my comments until then. 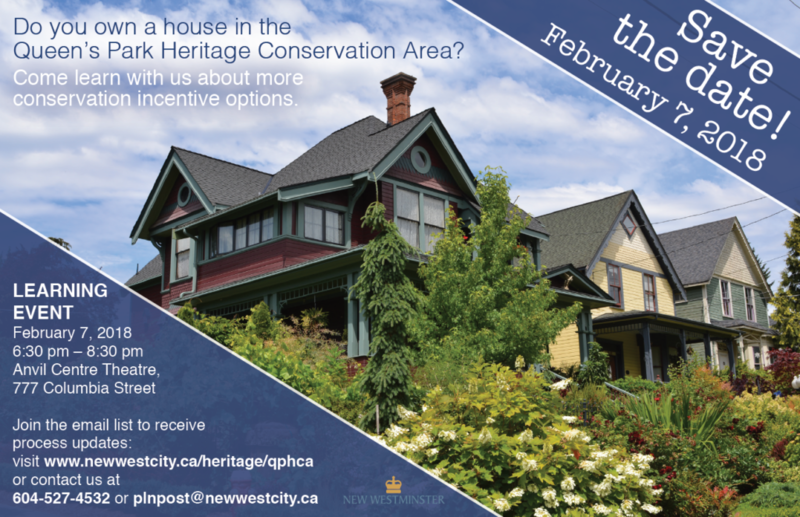 The Queens Park Heritage Conservation Area process is ongoing, as the City evaluates different types of incentives to encourage the preservation of heritage assets. The first round of community consultations around incentives discussed zoning-based incentives that may provide more building space entitlement (to build an extension to an existing house or a laneway/carriage house) or stratification of large homes. They were generally appreciated, but some people definitely wanted to see more, and we are giving staff the ability to explore a wider set of incentives and new rounds of public consultation. Here is a lot of good feedback from the neighbourhood and stakeholders here, and work to do! Metro Vancouver is delegated the regulatory authority over Air Quality (smoke, emissions, dust, smells) by the Province, mostly because most of the causes of air quality problems are closely related to Municipal jurisdiction (zoning, business licensing), but the results of bad air quality crosses municipal boundaries. MV has the Bylaws and enforcement staff to manage this issue. MV is bringing in regulations to reduce wood smoke pollution, and are phasing in these changes starting in 2020. They would ban using fireplaces in the summer (when the air quality impact is higher), and then would move towards requiring all fireplaces be registered and have a low-emission appliance. We had a great discussion with the Manager from Metro Vancouver during the meeting, which I think helped to clarify some of the questions around this proposed change. Metro is doing lots of public consultation on this (and no changes are planned until at least 2020), so let them know what you think! Snow levels are not anomalous, and it is a la Nina season, so there is no increased or decreased risk of flood in the spring. Stay tuned! I went on a bit of a rant here, as this is an issue we have talked about in the past, and despite some political will across the Province, we don’t seem to be able to make enough impact that the Provincial level. We have discussed Divestment in the past, and have taken some action to UBCM and the Municipal Finance Authority, but we have never been successful at getting the MFA to provide ethical investment options to municipalities. Instead, the MFA tells us that divestment is a difficult problem that is really hard to solve. No news there. When we invest in the oil industry we are investing in the value not of the oil in the ground, but of the value to be extracted when that oil is burned and the carbon released into the atmosphere. We are essentially betting that we can continue to put as much carbon into the atmosphere as we want, as long as it is profitable. We are betting against the continued stability of our climate, and against the same costs we are going to have to suffer as local governments as climate change worsens. I can’t support that. So here we are, in New Westminster, fighting a bitumen pipeline on the Brunette River, yet our investments are supporting the other side of this fight. I believe it is our duty to divest, and I believe it is in our self-interest to divest. Instead of supporting an update in our investment strategy that works against our own interest, we are going to take a better look at how we can make progress with the MFA, or what our other investing options are. A homeowner in the Brow of the Hill wants to formalize a legal secondary suite, but lack of a back alley and trees up front make it hard to put in more parking, so they need a variance. This request will go to an Opportunity to be Heard on February 19, 2018; C’mon out and tell us what you think! There was a bit of confusion about the wording of these two Variances on the agenda, but we got it clear. This is another case in Queensborough where very long lots are being subdivided to typical lot widths, but they run afoul of a requirement that lots can’t be more than 4x deep than they are long. This request will go to an Opportunity to be Heard on February 19, 2018; C’mon out and tell us what you think! As discussed above, Steel & Oak wants to expand seating capacity in their tasting room. Council gave this Bylaw amendment first and second reading. A Public Hearing will be held on February 19th, c’mon out and tell us what you think! As discussed above, we need to make some minor changes to language of our zoning bylaws. Council gave these amendments first and second reading. A Public Hearing will be held on February 19th, c’mon out and tell us what you think! We had a long Workshop discussion in the afternoon about how to best approach the pending legalization of recreational cannabis sales. I will do another separate blog post on this topic (Part C! ), but we agreed at that workshop to amend our Zoning Bylaw to formalize some of the language and our current approach as a temporary measure to prepare ourselves for July. This is more of a stopgap until July than anything else. It will go to Public Hearing on February 19th, C’mon out and tell us what you think. As discussed above, we are formalizing our Records Management in a Bylaw. Council Gave this Bylaw three readings. These Bylaws in support of the goals of the Queens Park Heritage Conservation Area were given three readings last meeting, and are now Adopted. It’s now the Law of the Land. Adjust your building envelope maintenance schedule accordingly! Councillor Puchmayr brought this item from the Restorative Justice Committee asking that Council support a resolution to FCM calling for the Federal Government to make Restorative Justice part of standard police training across the country. Council unanimously supported this motion. Then we had a few Notices of Motion for future meetings, and called it a day. Stay tuned, as in the next few days I will write up Part C of this epic council report, talking about our Cannabis Regulation workshop.